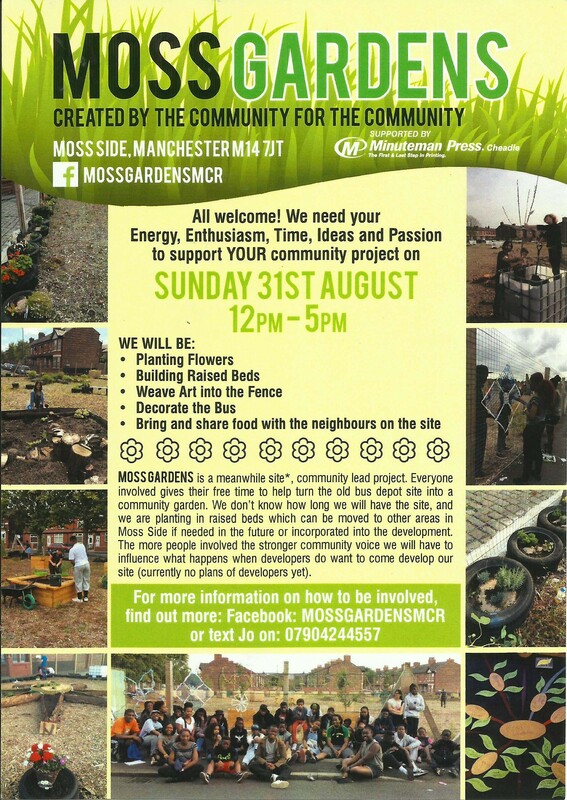 The “MossGardens” people have put out a glossy flyer which you can see to your right. After months during which not much appears to have happened at the site, (the far end of the old Stagecoach bus depot), they are having an action day, on Sunday 31st August. The Neighbourhoods Scrutiny Committee of the City Council is visiting the site soon. In fact, on Sunday 31st August. How often have you come down in the last month? Or is this in fact your first time here? What have you got out of being involved? When will you next be coming down? So why write? Well, because the word community is being steadily leached of its meaning. That sows cynicism, not flowering plants, and should be challenged. The same scepticism that is applied to the rhetoric that Manchester City Council spews out should also be applied to “civil society”. Or am I missing something?